The booth, CA team, Peperoni Sales Force :o) and networking. 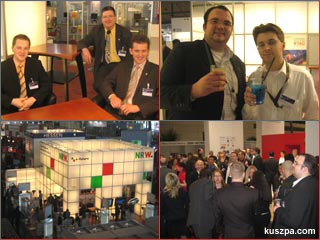 CeBIT is a good place not only to have some business meetings, but also to meet old friend e.g. from my old years of study; Carsten from TrendScouts Media Ltd. stopped by for a chat. But also Marcus (Peperoni team mate) popped up on the booth. But let me also introduce the other two projects from the University in Hagen and my colleagues… firstly we have the crew of the University of Hagen`s Certification Authority (CA) with Henning (Boss), Stephan (Team leader), Daniel and Ralph (Dudes). And then we have Andreas from the Department of Electrical Engineering, Control Systems Engineering group (PRT) with his project Pediaphon – Let your computer read out the Wikipedia for you!